You can't help but be intrigued by the work of Devorah Sperber, a New York installation artist exhibiting at Transylvania University's Morlan Gallery. Sperber's work consists of the most ordinary of household objects; this exhibit features her work in spools of thread and map tacks. The exhibit, Banal and Sublime, will awe you with the artist's determination with her materials and with her expressions about the nature of "seeing" art. Take Virtual Environment I, the largest piece in the exhibit. Constructed of more than 20,000 spools of thread, strung together into colorful cylinders and hung from a ceiling rod, the piece beckons attention with the gentle curving of the spools and its presence as a whole. The colors are stacked together in a somewhat comprehensible way -- the darks are together, the lights are arranged closely, and on standing back from the piece, you can catch a glimpse of the stone wall that the spools, acting as pixels, come together to produce. But you get an even better perspective viewing the piece from the adjoining wall, where convex mirrors are installed. Through the mirrors, you can see the image created by the spools perfectly -- a blue, brown, many-colored stone wall. So, you see the artwork best when you're not looking at it? Well, yes. Sperber subtly introduces questions about the act of "seeing" the installations. For Virtual Environment I, she confesses a desire to reverse the normal museum-viewing process. 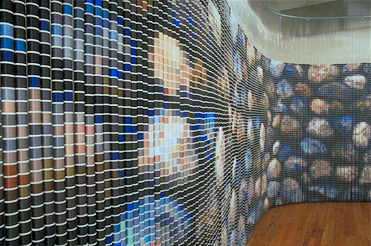 Instead of offering a "distant overview" of a large work and then inviting patrons to approach for a closer look, Sperber invites her audience to examine the unintelligible image, the "incomprehensible micro-perspective" of the spools of thread, then allows them to find the "photo-realistic" image in the mirrors. This reversal of the expected is more obvious in her Reflections on a Lake. On first entering Morlan Gallery, you are greeted with almost 6,000 spools of thread arranged in, at first glance, an illogical manner. Roughly 5 feet in front of the piece, a small pair of binoculars offers a chance to view the piece. The binoculars, fitted with reversed lenses, allow the viewer to get the correct perspective -- instead of a colorful but abstract view, the crystal clear image of a lakeside, with rocks, trees and cloud-dotted sky, comes through. To see a Sperber installation, from the large, pixellated view to the small, realized image, is a treat for the eyes and a game for the brain.